There are three species of boobies – a type of large seabird – in Galapagos: Nazca, Blue-Footed and Red-Footed. All three are gorgeous birds, but the Blue and Red-Footed varieties seem particularly special due to their unusually colored feet. After all, how often is it that you see a bird with blue feet? Unfortunately for me, I didn’t have a chance to see the Red Footed Boobies in person on this trip (I had to save something for the next go-round! 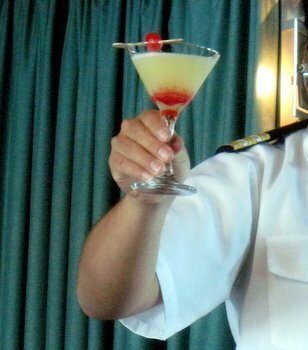 ), but I was able to sample a Booby-inspired drink from the ship’s excellent bartender. The Red Footed Booby Martini is tropical tasting and easy to drink, with a pool of bright red grenadine at the bottom of the glass that gives the drink its name. Skewer cherry with a toothpick and set on the rim of the glass to serve. Previous PostPrevious The mystery destination was… the Galapagos!